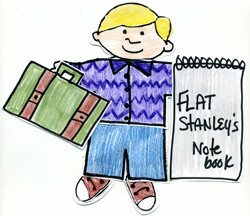 My Scrappy Life: My traveling "buddy"
I wanted to practice posting with a picture, so meet my traveling buddy "Flat Stanley." of a fifth grade class at Emerson Elementary School. So hopefully, they'll learn about Brazil, and I'll learn about well, lots of stuff.